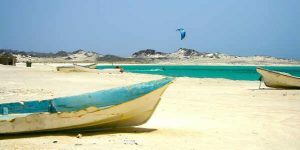 Masirah Island, with its unrivaled variety of diverse shallow-water and wave spots and reliable wind system of the Indian Ocean, is one of the world's best destination for a perfect kite holiday. Al Hail is the best kite spot in Muscat City. Beginners will find safe conditions in a protected environment at a sufficiently shallow area without any obstacles. Advanced riders will be happy to have reliable light wind conditions for Hydrofoil and Race kiting. Bar al Hickman / Al Khaluf - hidden lagoons and the "Sugar Dunes" at Oman's most beautiful beaches. The truly perfect conditions for flat water freaks, should not be visited without guiding due to difficult local conditions. We bring you there safely (and back)! Our highly trained VDWS Kite professionals will give you best possible assistance and professional support in perfectly elaborated training concepts. We offer the latest material, suitable for beginners as well as advanced riders, perfect for the local conditions and for maximum fun. Special light wind gear from FLYSURFER brings you on the water even during low-wind days. Kiters' Base Pack contains our rescue service at our spots and the use of our center facilities. So you're in the best of hands and can be sure that we take care of you. Overwhelming hospitality, breathtaking views and unique safety in Middle East. Fall in love with the land of 1001 Nights! You plan travelling to Oman? We have recent information and specials for your water sports holiday in the Sultanate! You need information for your travel to Oman or want to book kite courses or your holiday? We'll be glad to help! Tourist Visa are not longer issued on arrival at the airport. Travellers who want to visit Oman are asked to do their applications for visa online up front at https://evisa.rop.gov.om/ . This is subject to all travellerst who are entrering the country from 21.03.2018.